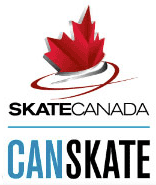 CanSkate is Skate Canada's flagship learn-to-skate program, designed for beginners ages 5 and up. Our sessions are offered from September through May and are taught by professional coaches who are specially trained and certified through the National Coaching Certification Program (NCCP). Skaters must wear a CSA-approved hockey helmet up to and including stage 5, helmet cages are strongly recommended for all stage 1 skaters. Participants must purchase their own skates and must wear gloves during the duration of the class. Agility: Concentrating on most turning and jumping skills. To receive a stage badge, skaters must achieve all Fundamental Area ribbons (Balance, Control and Agility) from the corresponding stage. The skill requirements for each Fundamental Area are indicated on the report card.